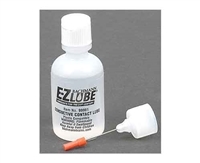 -Z Lube® Conductive Contact Lubricant & Cleaner from Bachmann®. Premium-Grade Lubricant for Novice to Expert Modelers In All Scales. For superior electric motor maintenance and track cleaning. Helpful instructions and tips for lubrication procedures included on the reverse side of the header card.